In previous lessons we have covered 3 note triad arpeggios and 5 note arpeggios. 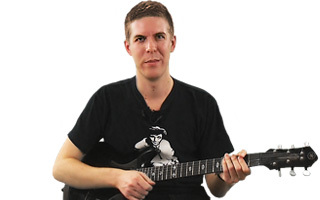 In this lesson I will focus on 4 note arpeggios, most accurately referred to as 7th arpeggios. With 7th arpeggios, we have a variety of types. There are major 7, minor 7 and dominant 7 to name just 3. When dealing with 7th arpeggios, we are essentially playing a triad (see Unusual arpeggios part 1) and adding some kind of 7th on top of that. For example, a major 7 arpeggio is essentially a major triad (R35) with the 7th note of the major scale added on, giving us a formula of R357. Minor 7 arpeggios are essentially a minor triad (Rb35) with the 7th note of a minor scale added (b7), giving us a formula of Rb35b7. It is essential in my opinion that you learn your chord formulas as these will really help give you an understanding of how these arpeggios are built. One of the main purposes of this lesson series is to show you a straight forward technical approach to your arpeggios, enabling a more efficient and smooth approach when playing them fast. Many of the traditional arpeggio shapes, although they have the same notes, are cumbersome to navigate in terms of technique, and developing any kind of speed takes years of work and even then will not yield the same smooth results that these fingerings and picking patterns will. I implore you to really try your hardest to adhere to the recommended fingerings and picking patterns as they will really give you a much smoother and faster result when you notch up the speed. I realize that music is not all about speed, but that does not mean that music cannot involve some speed, think of the great classical compositions such as "Flight of the Bumblebee" for example. In my opinion, as musicians we must be able to play fast, slow, loud, soft and everything in between. Sure, not everyone wants to shred, but surely its better to have a technical facility than not to have it. Some players have told me that if you develop technique you loose soul or become less creative. In response to that I say, only if you use it wrongly. That is akin to saying that a painter should not have the choice of all the colors as his paintings will be dull and lifeless, if he learns how to use all those colors well, his paintings will be magnificent â€“ and so will your playing! Never fear knowledge, embrace it and accept that it will take work before it feels natural â€“ but donâ€™t most good things take time and effort? In this first example we will look at the Cmajor 7 arpeggio, this arpeggio has a formula of R357 and goes great over a Cmajor7 chord, Am7 chord and D7 chord to name just 3! Maj7, min7, min7, Maj7, Dom7, min7, min7b5. So Major 7 occurs at the 1 and the 4 of the scale harmonization. Therefore, C major7 could be the 1 chord in the Key of Cmajor, or the 4 chord in the key of Gmajor. That means that the Cmajor7 chord will technically work on all the chords in the key of C and G major. Here are all the chords in both those keys. This arpeggio will work over Cm7, F7 and Ebmaj7. There are 3 minor 7 chords in any major key (2, 3 and 6), so potentially it would work over any of the chords in the keys of Bb, Ab or Eb. Remember, they are not all going to sound good, even if they do work on a theoretical level. The main thing is to experiment and have fun. Now we will look at some more exotic sounding arpeggios that are in fact derived from the modes of the melodic minor scale. Other scales also have 7 modes. Those scales are Melodic minor and Harmonic minor. The following arpeggios focus mainly on melodic minor. This is a 7b5 and works great over most dominant 7 chords as it really adds some spice in there and gives us a bit more interest than simply playing a regular dominant 7 arpeggio. Up next is a Cmaj7#5 arpeggio. This arpeggio can be used over the very unusual but very nice, Maj7#5 chord. Here is another nice arpeggio â€“ the 7#5. This is essentially an augmented triad (R3#5) with a b7 interval added on top. This one will work great over a C7#5 or C augmented chord. Continuing on our theme of unusual arpeggios, here is a C diminished 7 arpeggio â€“ this one has a formula of Rb3b5bb7 â€“ bb7 is the same as a 6th interval. This one is tricky but definitely worth the effort! This last arpeggio is Cmajor7 b5 â€“ It has the following formula â€“ R3b57. It can be used over major7 and major7b5 chords. This is really a great sounding arpeggio! Well that just about rounds things up for now â€“ remember to practice hard and try out all these arpeggios not only as technical exercises, but also as musical devices to make your playing sound more fluent and musical. Great players who apply arpeggios well would be Scott Henderson, Frank Gambale, Larry Carlton, Pat Metheney as well as many others. Remember to try and listen to other great guitar players to gain inspiration and also to get an idea of how they apply all these arpeggios into their own playing.